"You open up your Skype to the animal kingdom; they open theirs to you," she said. "I can send pictures to my animals … and I have to interpret [the replies they send to me]." Arquati, the city's first publicly known instructor on animal communication, launched the Chinese edition of her book, The Life Journey of an Animal Communicator: For Our Brothers and Sisters in the Animal Kingdom, at the Book Fair yesterday. Animal communication "depends on the animal, not on me", she said. "If the animal doesn't tell me the right information or it doesn't want to talk to me, I am not going to be any good." Arquati has lived in Hong Kong since 1977, when a job opportunity came up for her husband, a veterinarian. She jumped on the idea of working in a "mysterious" foreign city and ended up staying for good. "I was talking to my animals and was [considered] a little chi sin," Arquati said, using the Cantonese term for crazy. "I was often offered to take accommodation at Castle Peak." She recalled an example. 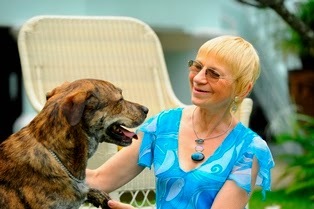 "I can smell fried rice and the lady [who owns the dog] just insists that her dog never eats fried rice," Arquati said. "She was actually rude to me. So I left … thinking that maybe I had got it wrong. "A few weeks later, she e-mailed me telling me that her mother feeds the dog fried rice."